Nysa… is probably as far from the sterotypical warrior woman as you can get. She’s a young girl working in a tavern, trying to earn enough money to buy the medicine needed to keep her dying mother alive. Then a weather wizard moves in across the street… I wouldn’t have considered this one to really fit the theme of warrior woman. In spite of that, I think I enjoyed it the most. I’m going to be checking out more of Ms. Snyder’s work. Keith wasn’t the only one to seek out Maria’s work. Her first novel, Poison Study, won the Compton Crook Award in 2006, and the third in the series, Fire Study, hit The New York Times bestseller list in 2008. Oddly enough, when Yelena was a poison taster, her life was simpler. But she’d survived to become a vital part of the balance of power between rival countries Ixia and Sitia. Now she uses her magic to keep the peace in both lands — and protect her relationship with Valek. Suddenly, though, they are beset on all sides by those vying for power through politics and intrigue. Valek’s job and his life are in danger. As Yelena tries to uncover the scope of these plots, she faces a new challenge: her magic is blocked. She must keep that a secret — or her enemies will discover just how vulnerable she really is — while searching for who or what is responsible for neutralizing her powers. 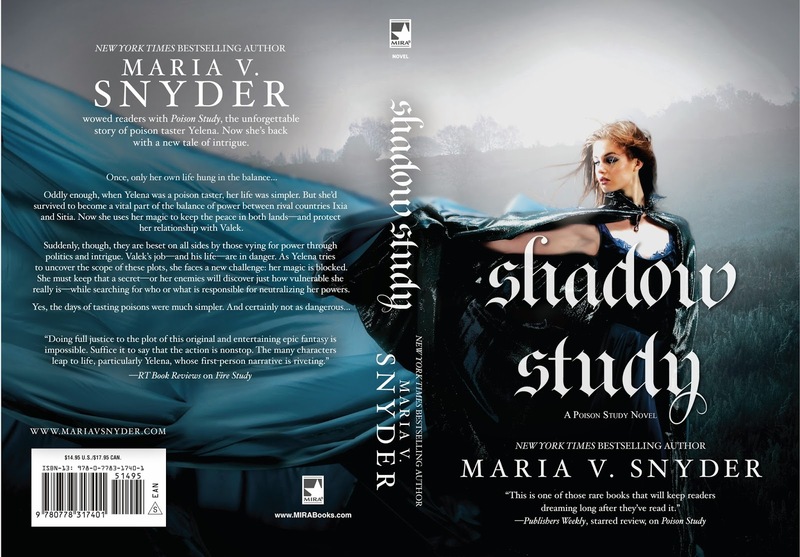 Maria has spent the last seven years working on several popular fantasy series, including Glass (Storm Glass, Sea Glass, and Spy Glass), which features several characters from the original Poison trilogy; the Insider series (Inside Out and Outside In), and the Healer trilogy (Touch of Power, Scent of Magic, and Taste of Darkness). Shadow Study will be published by Mira books this Tuesday, February 24, 2015. It is 416 pages, priced at $14.95 in trade paperback and $11.99 for the digital edition.